Both Ralph and I had our views on the perfect location for us to live. Nothing too fancy as long as it is a safe and a comfortable area surrounded by green trees and good neighbors. He doesn't like to stay in a cramped area and he prefers houses than condos or apartments. He likes houses with high ceiling and spacious. I wonder if he is a little claustrophobic. But, I guess he just loves the space for his family to grow comfortably. Well, for a person who has never lived in a condo or apartment like me, I would like to try once or maybe forever. I just love the surroundings, the facilities as well as the feeling of living high above the sky. One other thing, it is easier to clean and to maintain if I were to live in a condo. Even though we both don't share that particular part of the discussion but we do share one thing. We want to have big and spacious bathrooms. Perhaps bathroom these days is no longer just a place for one to do his or her business but a place to unwind and gently ease into or out of one's day. I imagine my bathroom to be huge and fitted with modern Bathroom vanities! 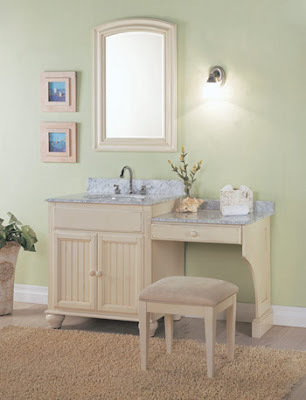 There are varieties of superb designs and materials of bathroom vanity especially from Fairmont Designs. If you have a taste for elegance or a fancy for a simple and casual decor, check out the bath division at www.fairmontdesigns.com as they offer bath vanities that match your lifestyle. With their proven track record of professional expertise in offshore manufacturing and international marketing, Fairmont Designs is the source for your home and contract furnishing needs. 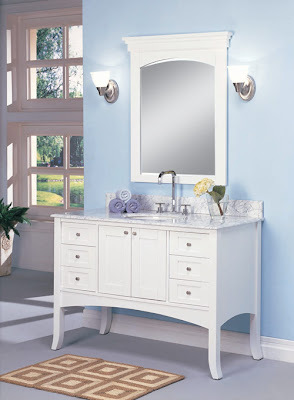 I know I will love this Fairmont Designs Fairmont Shaker 125-48 48" Vanity so much! I can stare at a huge mirror admiring myself. It is cool. No, it is marvelous! Not only that, I can store and organize my toiletries with ease in bathroom cabinet which also serves the centerpiece of my bathroom. What makes it even better if I can have a magazine rack where I can pick and choose my favorite magazine to read while you-know-what! I thing I am the same with Ralph. I hate the idea of staying in a condo. Never in my entire lifetime. :p Gimme five Ralph. Huge mirrors are awesome.. lol!! I agree, i love a safe and comfy home to stay. I need to get rid of you-know-who first, then only i can have a comfy and safe home. LoL. I don't mind having huge bathrooms as long as I am not the one doing the cleaning!!! Like Ralph, I also prefer landed property. I dislike staying in condo and apartments especially when you have to share the lift with others. Unless every unit has its on lift. Then I dun mind staying in a condo. LOL!! i prefer houses over condos or apartments anytime. i like spacious interior, large windows and open terrace with garden. yeah I know u need to get rid of I-know-who first LOL!